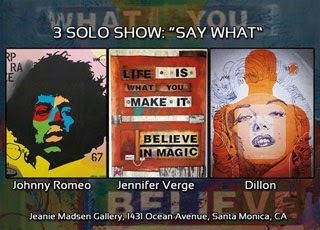 KTR Promotions in Venice Beach & Los Angeles California: Street Artist, Dillon Shows this Saturday, October 5th, at the Jeanie Madsen Gallery! Street Artist, Dillon Shows this Saturday, October 5th, at the Jeanie Madsen Gallery! Jeanie Madsen Gallery presents “Say What?” featuring artists Dillon, Johnny Romeo and Jennifer Verge.Jeanie Madsen talks about the upcoming show, “These artists all have something to say through an "urban pop" genre, with completely different styles, Dillion "street/popt" , Johnny Romeo "urban pop" , and Jennifer Verge Urban Pop. All three have different backgrounds LA, Canada, Australia... and all blend or flow perfectly for JMG (Jeanie Madsen Gallery). Johnny Romeo started painting as a child and has been showing his work ever since. His work can be seen in galleries around the world. 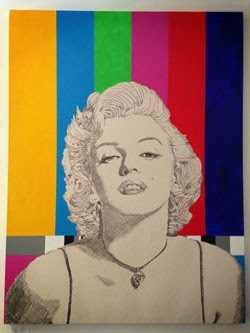 His work is inspired by pop culture and television. Jennifer Verge has been painting for seven years now. She is influenced by her positive attitude and wants her art to reflect that. She refers to her art as Urban Pop/Street.